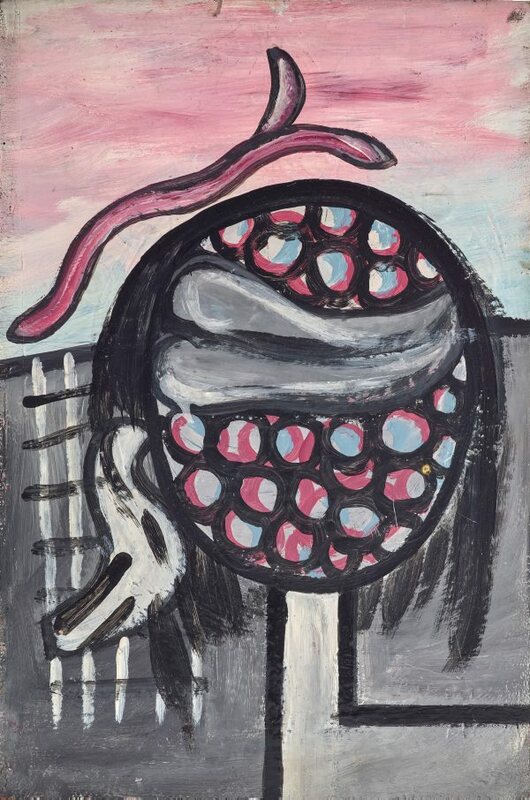 'Untitled (round tree)' c1941 was completed at the beginning of Sidney Nolan's residency at art patrons John and Sunday Reed's farm 'Heide', located near Heidelberg on the north-western outskirts of Melbourne. Nolan's works from the late 1930s and early 1940s are highly experimental in terms of material and imagery thanks in part to the financial support provided by the Reeds and the creative environment they fostered at 'Heide'. 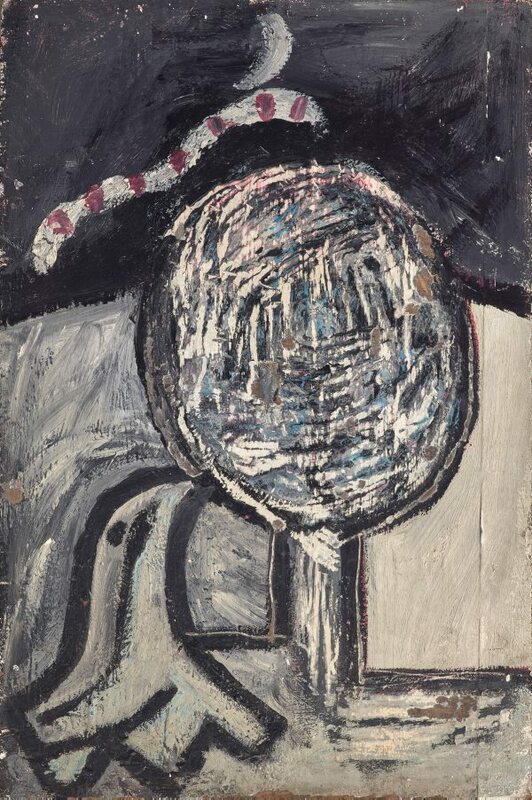 'Untitled (round tree)' has its pictorial origin in the artist's infamous painting 'Boy and the Moon' also known as 'Portrait of John Sinclair at St Kilda' or 'Moonboy' c1939-40. 'Boy and the Moon’s' controversial inclusion in the Contemporary Art Society exhibition in Melbourne and Sydney (1940) polarised critical debate on abstraction as opposed to representation and signalled Nolan's transition toward figuration. The minimal yet suggestive imagery of 'Untitled (round tree)' negotiates this dichotomy. The 'Moonboy' motif, manifested as either a head and/or tree, was a visual device employed by Nolan throughout his career. For example he painted this symbol on the roof of the Reed's Heide farmhouse in (1941), used it in illustrations for Robert Lowell's 'Near the ocean' (1967) and the Ern Malley poems (1974); as well as in theatre sets for Igor Stravinsky's 'Rite of Spring' (1962) and Charles-Camille Saint-Saëns 'Samson et Dalila' (1981). Moreover, Nolan produced an early group of paintings on roof slates and hardboard to which 'Untitled (round tree)' belongs. Art historian Jane Clark (Sidney Nolan: landscapes and legends (1987)), has attributed this earlier group's lyrical imagery of trees, moons and lovers to the influence of Rainer Maria Rilke's poetry. Alternatively, their clear biblical symbols (garden, fruit, snake and angels) could be interpreted as autobiographical given the complexities of the artist's personal circumstances at the time. In 1941 Nolan began his affair with Sunday Reed following separation from his first wife Elizabeth and the birth of their daughter Amelda. He would later recall in an interview with Elwyn Lynn that 'I did a few of birds nestled against those spherical forms: everything was nestled together with very few interstices….I was interested in the wounded bird looking for help and comfort'.